January is not generally the month of choice to fly yourself from Alaska to Canada. But if you are planning such a trip, why not help test an app to make filing your eAPIS notices easier? AOPA is collaborating with Jeppesen and Airside Mobile to develop an app to use when filing eAPIS reports, required when you leave or enter the US. A free beta version of the app, Jeppesen Mobile QuickClear will be tested in the next 5-6 weeks. If you are planning a cross-border trip in this time period, and would like to provide feedback to the developers, contact Matt York at [email protected] for details. And don’t forget that in addition to filing an eAPIS report when leaving or returning to the US, you must also contact the Canadian and US port of entry you plan to fly to, by phone, to arrange for arrival. See AOPA’s website for details on flying to international destinations at http://aopa.org/travel#international_travel. The three leading candidates in the Alaska Governor’s race addressed an Aviation Town Hall on Monday, Oct 1st and responded to questions on a variety of aviation topics. Hosted by the Alaska Airmens Association, the forum provided the three leading candidates; Incumbent Governor Bill Walker, former State Senator Mike Dunleavy and former US Senator Mark Begich, an opportunity to explain how they would address a variety of issues. 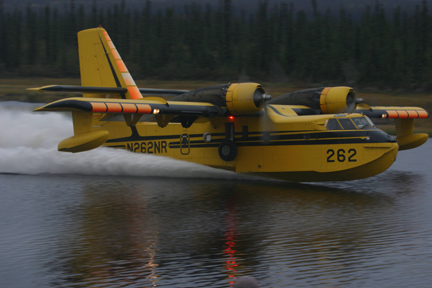 Questions covered topics ranging from funding of the 239 airports operated by the Alaska Department of Transportation and defending access rights, to how their administration would support training the next generation of pilots and mechanics. 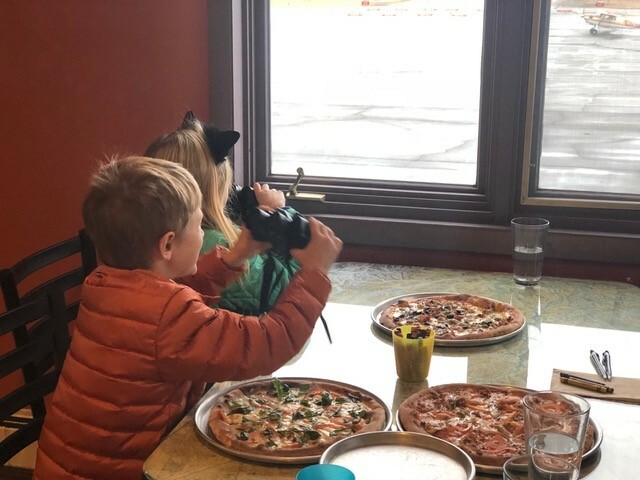 Held at the Alaska Aviation Museum, on Lake Hood, the event drew a crowd of close to 200 people. Airmens Association Executive Director Corey Hester, and the Director of Government Affairs, Adam White, moderated the session. Audience questions, collected in advance, were delivered by members of the Airmens NextGen Group. Partners in the event included AOPA, Alaska Air Carriers Association, EAA Chapter 42, Women in Aviation and the Lake Hood Pilots Association. From left to right, candidates Dunleavy, Begich and Governor Walker address an aviation crowd. The session was moderated by Airmens Exec. Dir. Corey Hester and Govt. Affairs Dir. Adam White. 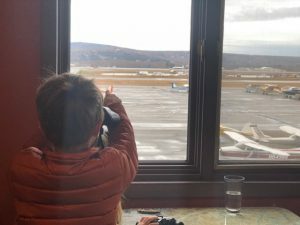 October 1, 2018 / Tom George / Comments Off on What happened to Alaska’s Department of Aviation? 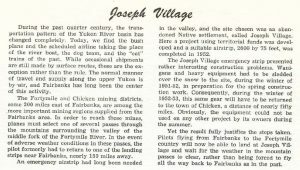 While still a territory, and well before achieving statehood, Alaska had a dedicated aviation department. Acknowledging the Alaska pioneers’ foresight in creating a dedicated department speaks to the importance of aviation in Alaska’s past. And with regards to Alaska’s future, the question most importantly asked is—what happened to it? After some digging in the shelves at the Elmer E. Rasmuson Library at the University of Alaska in Fairbanks, the answers to these and other questions are starting to see the light of day. Along with some hopeful thoughts about the future. Going back to the 1920’s, airfields developed organically as individuals or companies acquired airplanes, and needed a place for them to take off and land. 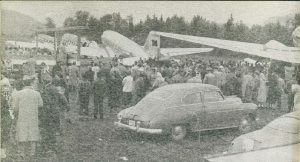 Often a ball park or agricultural field was pressed into service for early day aircraft operations, which eventually turned into a dedicated “airfield.” While considered a luxury in some parts of the country, in Alaska airplanes were appreciated from the beginning for their potential to reach remote locations quickly—places previously only serviced by water ways, or trails. The Territory of Alaska first invested in aviation infrastructure in 1929, when it appropriated funds to “…purchase, install and maintain radio-telephone station equipment for the larger towns.” This task was conducted under the direction of the Territorial Highway Engineer, who was soon overwhelmed, given the existing responsibilities to develop roads and harbors. At the time, this was a one-person operation, responsible for an area a fifth the size of the lower 48 states. In 1946 Congress approved 10 million dollars to build or expand airports in Alaska over a seven-year period. The funding formula provided 75% of the cost of construction, requiring a 25% match by the territory or municipality that owned the airport. While that sounds like a lot of money, it was recognized by the Aeronautics Commission as “a drop in the proverbial bucket to properly expand our airfield program in a new, undeveloped country having an area equal to six western states…”. But there was a catch. The territory had to adopt new enabling legislation to allow the money to be accepted, either by the territorial government, or individual municipal airport owners. This legislation was introduced but not passed in 1948. At the time municipalities could own and operate airports, but their authority did not extend from year to year, which was a requirement to enter into an agreement with the federal government for airport funding. 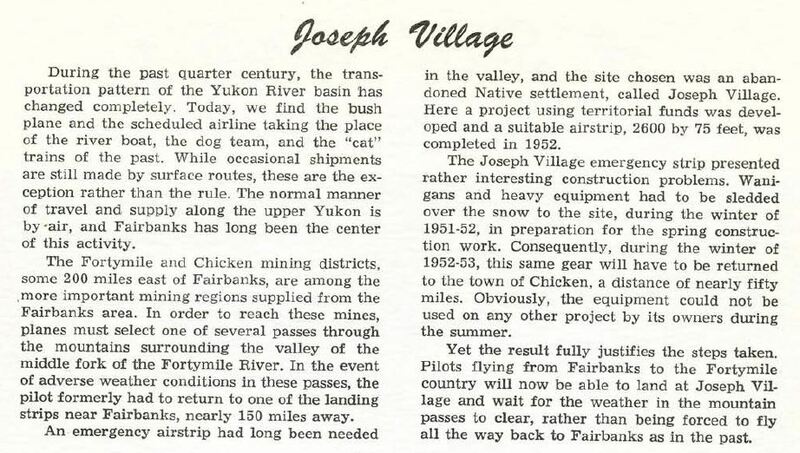 Frustration in the Aeronautics Commission report from 1947-48 clearly expresses this sentiment, “…the foregoing explains why Alaska has not received five cents of the ten million dollars allotted to the Territory under the Federal Airport Expansion Program…”. $10 million dollars was a significant resource for the Territory in 1946. In today’s dollars, that is about $127 million, spread over 7 years, or an average of $18 million/year. In comparison, presently Alaska receives over $220 million/year from FAA’s Airport Improvement Program to improve airports across the state. The Alaska Aeronautics Act, passed by the Territorial Legislature in February 1949, finally solved this problem and established the Alaska Department of Aviation, a peer organization to the Department of Highways, effective June 1st of that year. Revenue for the department came from allocating one third of the 2 cent tax on motor fuels then in effect. The first report from the department, covering just six months of operation, reported 73 projects started “improving existing airports and seaplane bases, and building new air facilities.” Having lost three of the seven years to invest the federal funding, the department was ramping up to develop airports that would support transport category aircraft operations, which were typically DC-3s at that time. 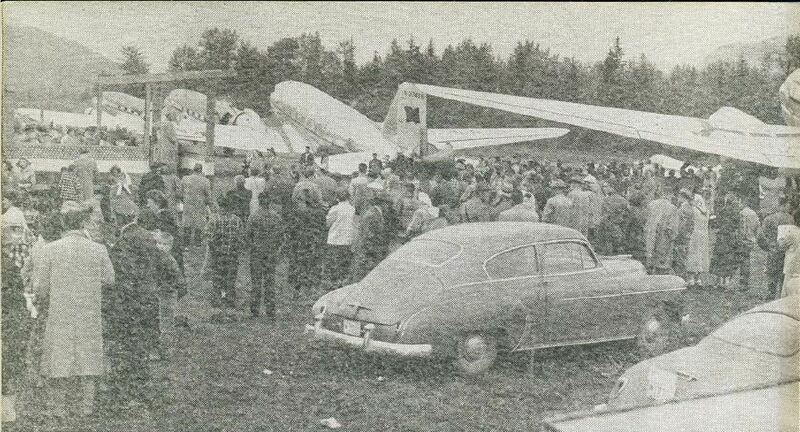 Dedication of the new air-carrier runway at Seward in 1952, from the Alaska Department of Aviation Biennial Report. 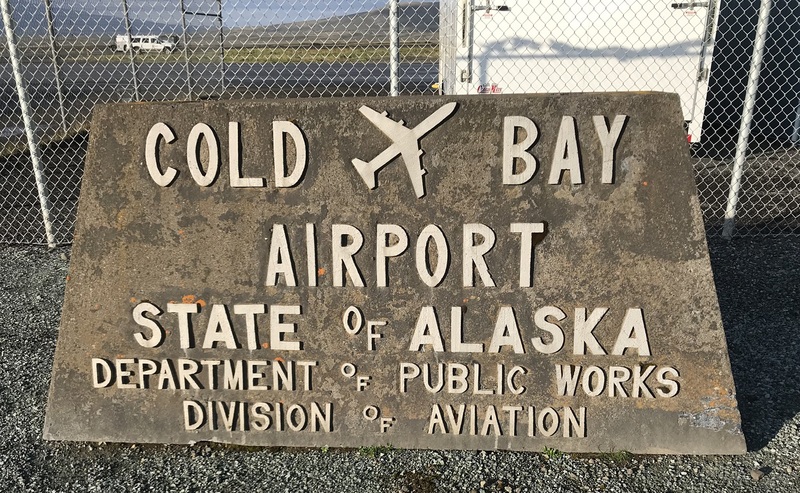 By 1953, fifty years since the Wright Brothers demonstrated powered flight, the Alaska Department of Aviation was in full swing, developing the airport system across the Territory. In the biennial report for 1951-52, the Department had a hand in building many of the 360 airports and 73 seaplane facilities existing then. The report summarizes the accomplishments of the department over the first 3½ years of operation. 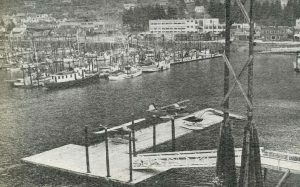 A new seaplane base at Juneau was one of several similar facilities constructed in southeast Alaska by the Alaska Department of Aviation with a combination of federal and territorial funding. Having grown from a short, type-written report to a type-set 65 page document, it contains descriptions and pictures of many of these facilities. This document (link above) provides a flavor, not only of the range of projects, but the enthusiasm shown by the department for expanding Alaska’s airport network. In addition to significant work on “air carriers” runways, they were building seaplane bases, emergency airstrips, and installing radio beacons. Provisions were also made for snow removal and general maintenance at the airports and seaplane bases in the Territory. 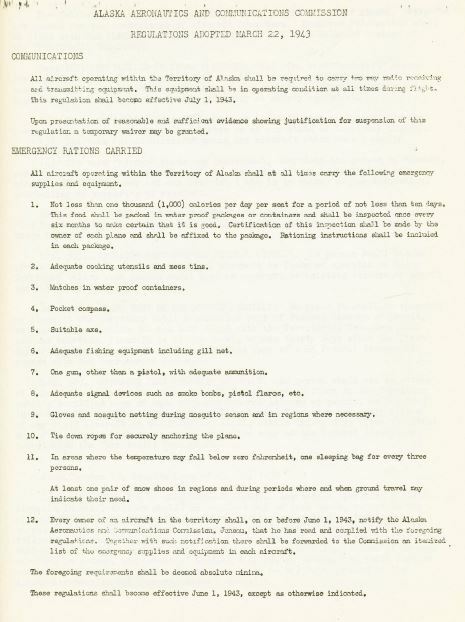 Documented in the Territorial Department of Aviation 1951-52 Biennial Report, the Alaska Department of Aviation constructed aviation infrastructure needed to support the entire system. 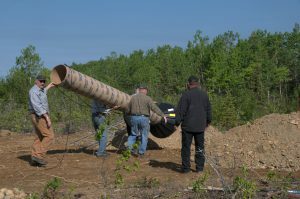 In this case constructing an emergency landing strip east of Fairbanks, in support of the Fortymile and Chicken mining districts. 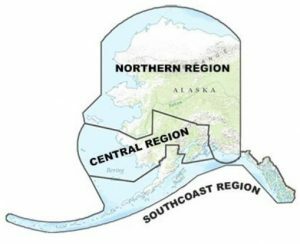 Alaska was well on its way to expanding the network of aviation facilities needed to provide access across the Territory. Alaska was on the path to become a state by the end of the decade. Alaska became the 49th state on January 3rd of 1959, and with that, transitioned from territorial to state government. The territorial Alaska Department of Aviation now became the Division of Aviation under the State of Alaska, Department of Public Works. It continued to plan, design, build and operate airports across the new state. 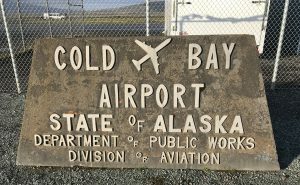 By 1973, the division reported operating 235 airports, and had recently taken over operation of the Kodiak airport from the Navy. This unit of state government continued to improve the aviation infrastructure across the state, until a major re-organization in state government lead to the structure more familiar to us today. After eighteen years, the Division of Aviation was re-organized when the Department of Public Works and the Department of Highways were combined. Executive Order No. 39, signed by Governor Jay Hammond, created the Department of Transportation and Public Facilities (DOT&PF), effective July 1, 1977. The aviation functions previously managed under a single division were now spread across many of the seventeen divisions in the new organization. In addition, more emphasis was given to regional geographic divisions. There were five regions at the time, which have been consolidated down to only three today; Northern, Central and South Coast Regions. Each region is managed by a Regional Director, and has separate staff who perform planning, design, construction, maintenance and operations functions. 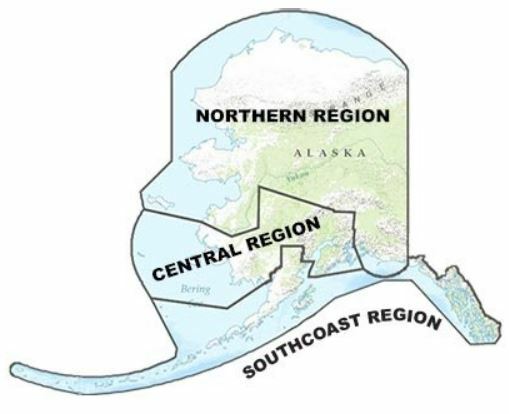 The regional divisions of the modern Alaska Department of Transportation & Public Facilities. Today aviation roles are largely spread across the structure of the three regions that dominate our modern DOT&PF (often pronounced dot-puff). The functions of planning, airport design, construction, and maintenance and operations are managed jointly for highways and airports—separately in each region. As an aviation advocate, it is challenging at times for a community member served by an airport to figure out where to go to address an issue. Entirely different teams from DOT&PF typically interact with a local community during the life-cycle of a project. This is not to in any way fault the employees of the department—but is a consequence of the organizational structure. Another difficulty with this structure is that each transportation mode has its own highly technical set of rules, regulations, and standards—defined largely by the FAA for airports. Expecting the professional staff of the department to keep up to date on both airport regs and rules as well as highway requirements and standards is a tall order. AOPA, along with the Alaska Airmen and other aviation organizations, has long advocated for a true division of aviation within the DOT&PF. During the past few years, the department has taken some steps in this direction. The oversight of leasing and safety functions for the rural airport system has moved from the regions into the Statewide Aviation Division. Lead by the Deputy Commissioner for Aviation, this group also conducts aviation system plans, and develops spending plans for the federal funding that builds and improves airports. Headquartered in Anchorage, it has staff that are based in each of the regions. Also, under the current administration, DOT&PF is prototyping the use of cross-functional teams to work on projects in specific geographic regions, which may improve communications both within the department and for local stakeholders. AOPA would like to see other functions become specific to transportation mode, allowing staff interested in airports to pursue that career path. There will probably always be staff shared between highways and airports in the field, however, having the planning, design and operations performed by employees focused and trained on airport rules, regulations, and standards should help the aviation users, as well as the local communities served by each airport. Look for more advocacy on this front in the months and years ahead! If you fly into Gold King (PAAN), look for the new windsock on the north east corner of the field. The old windsock remains at the other end of the airport, giving pilots an additional “tool” to evaluate the wind before landing on this backcountry strip, on the northern flank of the Alaska Range. 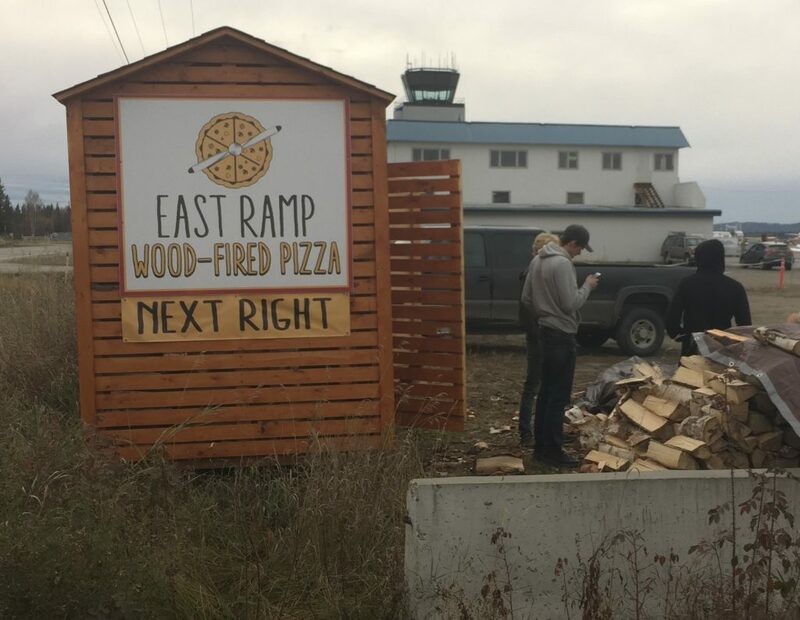 While it might not seem like a big deal, this represents a collaborative effort between a small group of stakeholders that rely on the airstrip and the Alaska Department of Transportation & Public Facilities (DOT), who owns the facility. AOPA Airport Support Network Volunteer Dave Pott helped coordinate between DOT and the locals, to accomplish this upgrade to the airfield. While it took over a year and two work parties to complete, this is a success story about improving a backcountry airstrip. 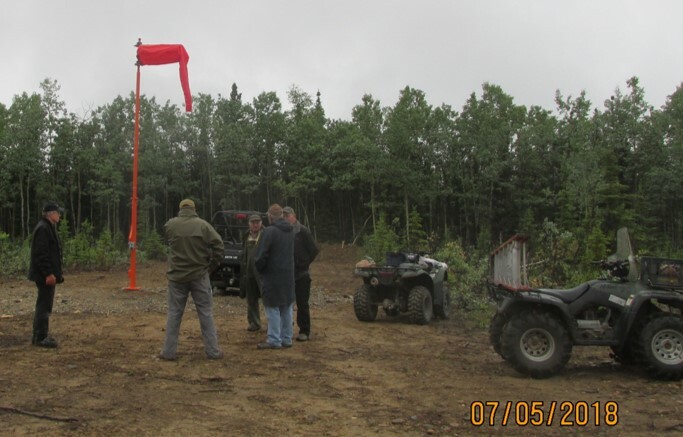 New windsock flys on the north east corner of the Gold King Creek airstrip. Gold King is not a typical “community airport” operated by DOT&PF. It fits into the realm of backcountry airstrips, generally located off the road system that provide access to public lands across the state. Each backcountry airstrip has its own story, and Gold King is no exception. Established in 1959 as the Gold King Creek Radio Relay Station, it housed a microwave radio relay tower, equipment building and ~2,000 foot airstrip. The station connected the Ballistic Missile Early Warning System (BMEWS) at Clear Air Force Base (35 n miles west) with a chain of stations that linked defense radar stations, known as the White Alice Communication System. These radio relay stations stretched across Canada ultimately providing communication to the NORAD headquarters in Colorado. The unattended facility was powered by diesel generators with fuel flown in to the airstrip. Satellite communications eventually replaced the need for the ground-based system, and the facility was closed in 1988. When the Air Force returned the land to the State of Alaska, the Alaska Department of Natural Resources made some of the surrounding property available to the public, which resulted in construction of a number of summer or year around homes in the area, with the airstrip serving as the principal source of access. Beyond meeting the needs of local property owners, Gold King serves a much larger role in the north central Alaska Range. Today listed as a 2,500’ airstrip, Gold King satisfies a number of needs. Due to the access provided by the airstrip, the University of Alaska utilized it as a location to locate a seismic sensor. The Bureau of Land Management has established a Remote Automated Weather Station (RAWS) there, to help monitor fire danger. 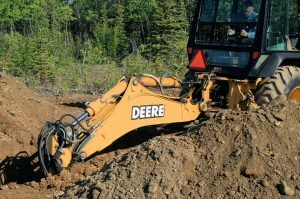 Because it is situated on gravel deposits underlain by bedrock, the airstrip is quite stable, making it a good staging area for aircraft hauling gear or supplies into mines, cabins or recreation sites with smaller airstrips or off-field landing areas. It becomes a popular staging area during hunting season in the fall. Finally, the airstrip serves as an alternate place to land and wait when weather keeps aircraft from getting to their planned destinations. After the Air Force suspended its use of the relay station, the federal government transferred the land to the Alaska Department of Natural Resources (DNR). While they made the land around the airstrip available to the public for homesites or recreational cabins, keeping the documents current for the airport was not a priority. When the Fairbanks Sectional Chart was published in 1998, Gold King had completely disappeared from the map! Fortunately, in response to aviation industry requests, the airport was transferred from DNR to DOT, and slowly re-appeared—initially in 2003 as a “closed” airport, with unknown runway length or condition. 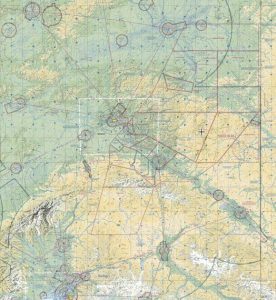 Today the chart and entry in the Alaska Supplement, reflect more complete information, including a CTAF to use when operating in the area. 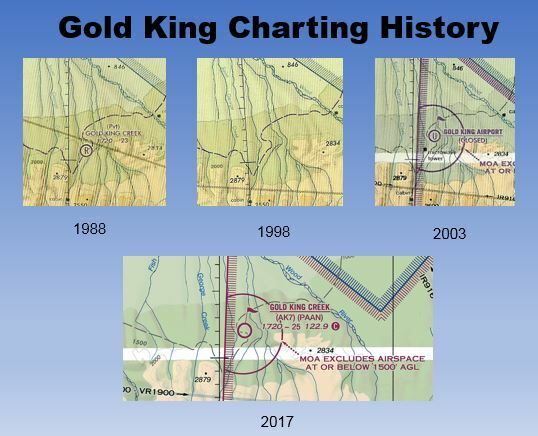 Under Air Force management, Gold King was charted as a private airstrip. After the Air Force shut down the facility and transferred it to the State of Alaska, it briefly disappeared from the charts. After the airport was transferred from DNR to DOT, it has been more completely described. Local equipment was used to excavate a spot for the new windsock at Gold King. Dave Pott is the Airport Support Network Volunteer at Gold King. He is retired and spends the majority of the year living just off the airport. Working with other land owners, a volunteer group keeps an eye on the airport, and has banded together to do limited maintenance on the field. Last year, he reached out to DOT and requested their assistance to replace the windsock, which was in a state of disrepair. DOT responded by supplying a new windsock assembly. They had it delivered to the airport in the fall of 2017, along with bags of cement to properly anchor it, deep in the ground. Volunteer crew placing the form for the base. In early June, the locals held a work party to start the installation. 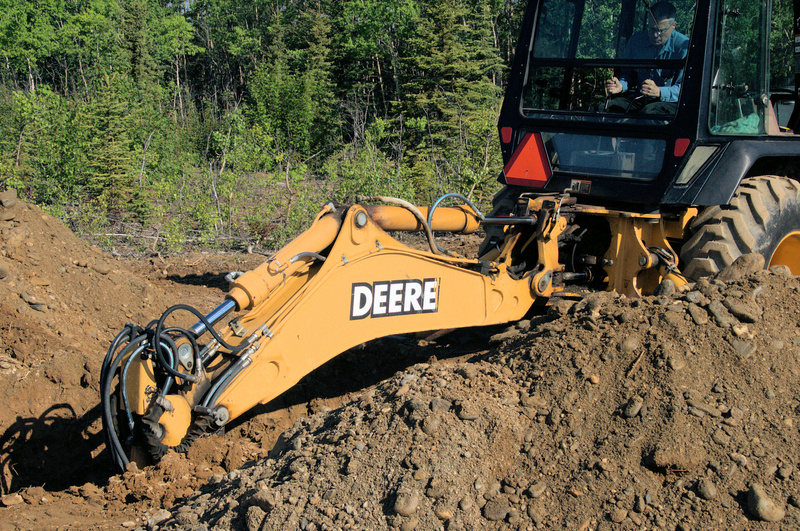 The volunteers provided a back hoe to excavate a hole for the base and flew in a cement mixer to support the project. 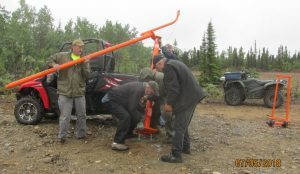 On July 5th, a second work party took place to put the stand on the base and raise the windsock. Work party two: mounting the windsock stand on the base. airstrip in good condition. In these times of tight budgets, collaborative efforts between stakeholders will be essential to keep our backcountry airports across Alaska in good working order. Look for projects in your part of the state, and if possible, lend a hand! National Park Service (NPS) is the planning to hold listening sessions, and would like to hear from people who use any parts of the Wrangell-St. Elias National Park. Session are scheduled for four communities in the vicinity of the park this summer, but additional sessions are anticipated later for more than a dozen communities including Anchorage and Fairbanks. Given the importance of aviation for access to most of the park, individual pilots, as well as businesses that rely on aviation should participate in this effort. Largest park in the nation, Wrangell-St. Elias National Park is holding listening sessions. Management plans often drive what happens in national parks. Periodically NPS updates these plans, using the opportunity to evaluate how the park is being used and what pressures it is experiencing. Part of that process involves hearing from the wide range of people that use the park, be it for hiking, mountain climbing, camping, flight-seeing or exploring the historic mining operations that once took place in the Wrangells. This the largest park in the nation, at something over 13 million acres in size, with few roads and trails, making the airplane a key tool for access. Wrangell-St. Elias National Park has a network of public use cabins, many of which are only available by aircraft. The aviation community has a history of working with NPS to help maintain some of the strips used to reach these cabins. This July 13-15, the Recreational Aviation Foundation is organizing a work party to maintain the Peavine Bar Airstrip. For information, or to participate, see: http://theraf.org/civicrm/event/info?id=398. This is a good opportunity to help improve this infrastructure, while having some fun at the same time. NPS started a “backcountry” plan in 2015, and held an initial set of listening sessions. Since that time, key positions at Wrangell-St. Elias have turned over, including the superintendent. As the new management team evaluated the previous work, they discovered that a number of the comments received were focused on the frontcountry—or more developed and accessible parts of the park. Consequently, Superintendent Ben Bobowski is interested in hearing from stakeholders, to learn about their issues and concerns for all parts of the park. Once they have a better handle on stakeholder issues, they will decide what type of a plan to develop. The first four listening sessions, scheduled for this summer. More sessions will be help in the months ahead. If possible, participate in any of the listening sessions currently scheduled. Comments may also be provided by email at: [email protected] or through the NPS planning website: http://parkplanning.nps.gov/WRSTListens. As the planning process proceeds, AOPA will follow it closely, and may be asking your input on aviation issues related to this park that encompasses everything from active volcanoes to massive glaciers and ice fields. It is a national treasure, and the airplane provides one of the few ways to reach its most distant features. 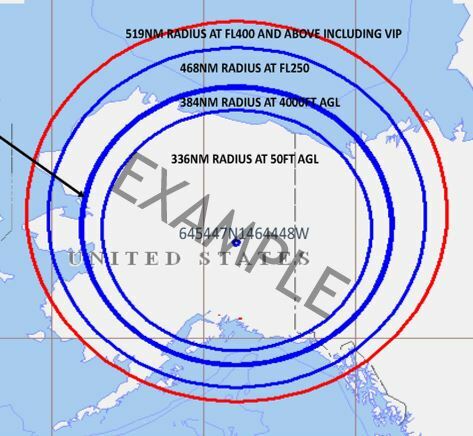 The FAA is proposing to change the Class D and Class E airspace surrounding Juneau. 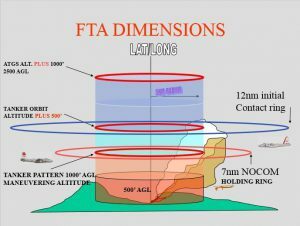 In the proposed rule modification, FAA outlines the changes which will expand the Class D airspace west and south east of the current boundaries, and eliminate some of the Class E airspace that is an extension to the Class D surface area west of the airport. The FAA also proposed to reduce the size of the Class E airspace extending upward from 700 feet above the surface around Juneau. 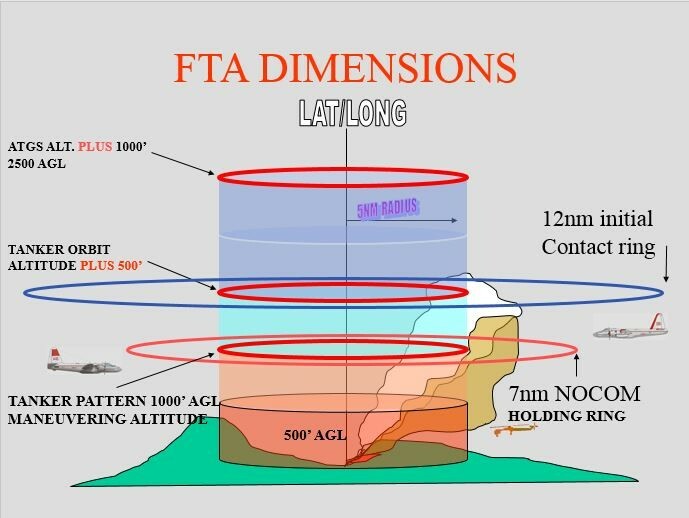 Pilots using this airspace should study the changes and provide comments, if the proposed changes impact your operations. 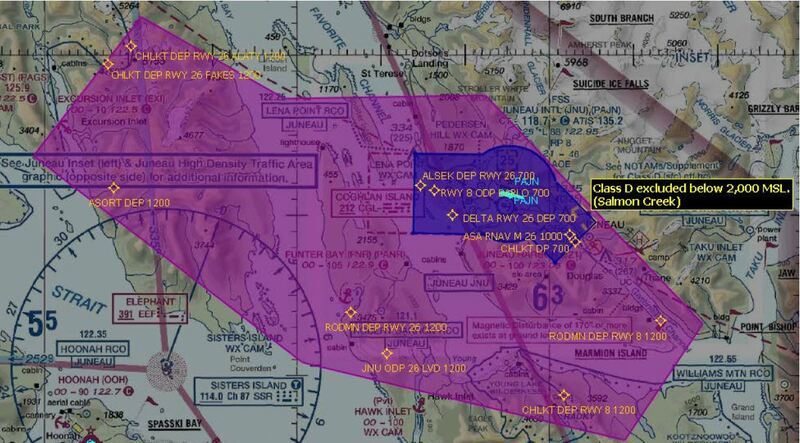 A depiction of the entire change to airspace around Juneau International Airport. 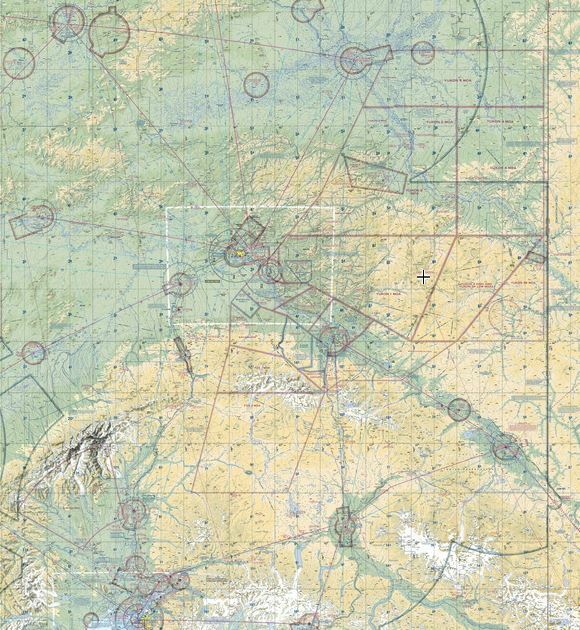 Close up of the proposed changes showing the expanded Class D airspace and elimination of the Class E extension to the Class D surface area. The proposal is available online at: https://www.regulations.gov/docket?D=FAA-2018-0125 . Comments may be filed online, and are due by June 18. If you comment, please share your input with AOPA [email protected].